OH! The cheese that comes off that post title! Let’s enter the inner workings of my mind. I’m a big RHOBH addict (and for those who don’t know what that stands for, it’s the Real Housewives of Beverly Hills.) I think my favorite character has to be Giggy the Pom that Lisa V so prominently carries everywhere. I just finished watching an episode and Giggy was on the brain. Which led to me singing the ever so classic Will Smith song Gettin’ Jiggy With It. And, since we are discussing how to grout the tile in our bathroom, it just so happened to easily slip into the lyrics of the song. Bomp, bomp, bomp gettin’ groutty with it. I’m a nerd, who cares! So now that there is that intro, let’s move on to the ever so long #projectbathroomreno update. Good news is something is actually finished; and, that something is the floor! Lots of cheers and high-fives. Last week we touched on the beginning of the tile project. 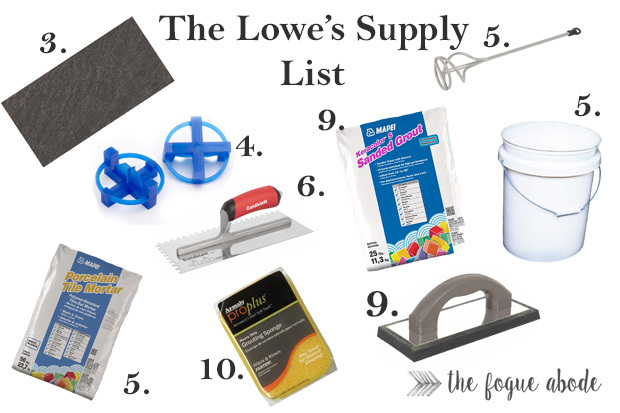 Today, I am back to break down exactly how we accomplished tiling our own floor. 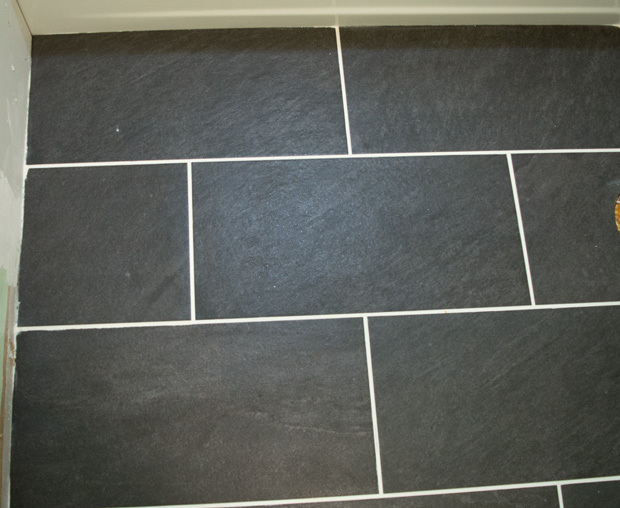 Thanks to an array of YouTube videos and online resources, we are amateur experts at floor tiling! Well at least the Mr is. 1. Start with a clean plywood subfloor. Our previous floor was laminate which was fairly easy to remove. We also took out the toilet to get in behind it. 2. You want to find the middle of the room and mark it. This will be your starting point. 3. 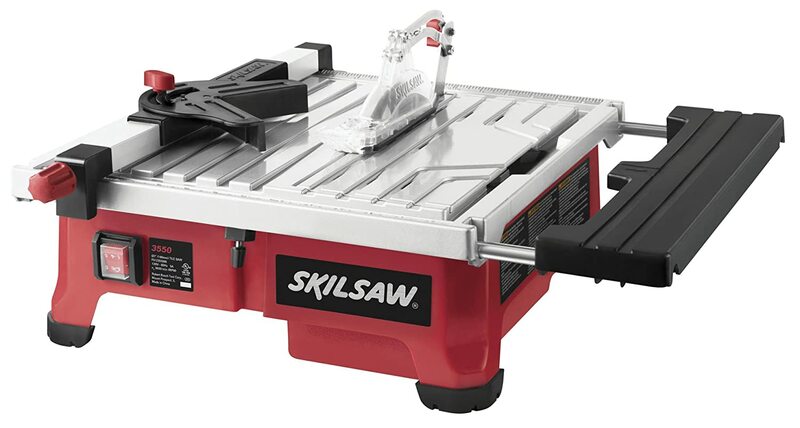 We did a dry lay of the tiles and made our cuts using this wet saw we got off Amazon. 4. We made sure to # each of the tiles in order to help us remember where they laid and used tile spacers to make sure the tiles were evenly spaced.. That way we could work our way out the door. 5. You will then take your thinset mortar and mix it using a drill mixer in a standard bucket. 6. We’ve established that I’m a nerd, next is my favorite part, applying the thinset. Use the smooth end of your trowel and spread a thin layer over your subfloor. Then, use the notched edge in a straight pass (to add those cool looking lines.) The lines are actually used to help air escape when you apply the tile. 7. 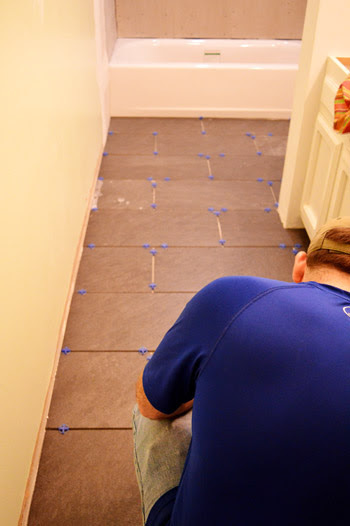 Set your tile in place and press it down with your finger tips. 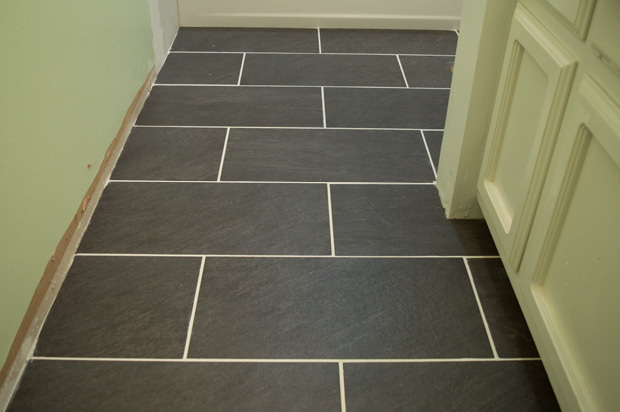 Use your tile spacers to keep an even space between each tile. Repeat this step until all of your tiles are laid. 8. Let the mortar dry overnight. 9. Mix your grout and add it to the lines between the tiles with a rubber float, pressing the grout to fill the indentions. 10. Use a wet sponge to remove any excess grout and grout haze. 11. Let the grout dry for a bit and repeat step 10 to remove the remaining grout haze. Isn’t it pretty! 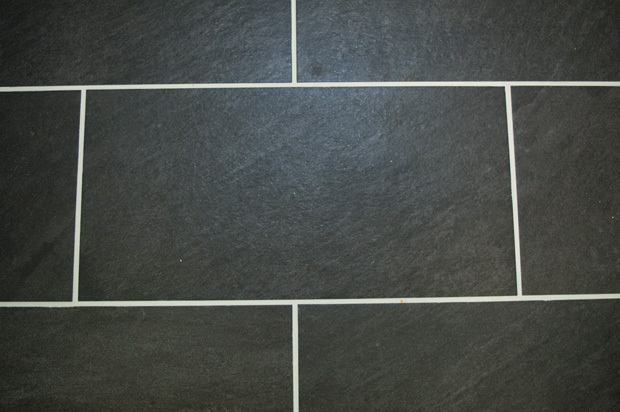 I love the look of this dark tile against the thick white grout. But don’t you worry, even us expert amateur’s (or is that amateur expert’s) get it wrong sometimes too. Nothing to worry our pretty little heads over though. I think the tile looks great, now on to getting this room painted. After living with this tile for two years, we talked about how to maintain the white grout so that it stays poppin’. Great job on the tile! 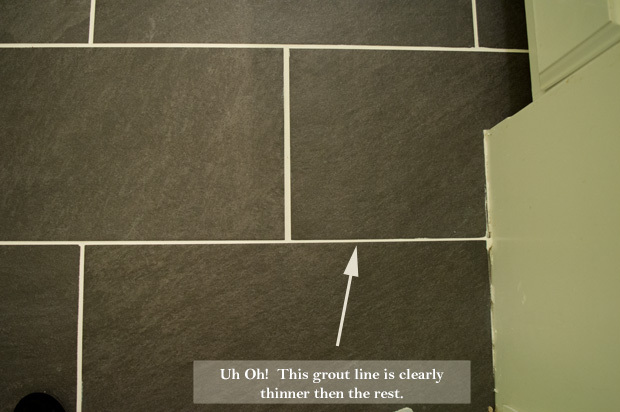 I'm a little nuts about grout lines and can't help staring at the few in our bathrooms that aren't quite right, but no matter how many people see the work, none of them ever notice it. So I have to say, had you not pointed out the one small line, I never would have noticed. 🙂 Are you going to use a sealer on the tile/grout? Thanks for stopping by! My OCD eye is the only one that's caught it so far. And yep, we got our grout sealer this weekend.